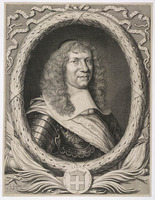 CHAMBLY, JACQUES DE, captain in the Carignan-Salières regiment, seigneur of Chambly, and governor of Acadia, son of Philippe de Chambly and Louise de Laulne; d. 1687 in Martinique. Descendant of an old and illustrious family which had been impoverished as a result of the wars, Chambly had served in Hungary and had commanded the regiment of the Maréchal d’Estrades. 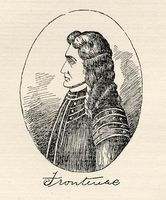 He arrived in Canada in June 1665 as captain of a company in the Carignan-Salières regiment; he directed the construction of Fort Saint-Louis on the Richelieu Rapids and took part in Prouville de Tracy’s expedition against the Iroquois cantons. The following year he received a gratuity of 400 écus from the king. When the regiment was disbanded, Chambly returned to France; but, having been recommended by Talon, he returned in 1670 as captain of a company of colonial regular troops. He began the establishment of a farming settlement around Fort Saint-Louis, where he lived, and received three of the horses that Talon had had sent out from France. In 1672 he obtained the grant of a seigneury three leagues long and one deep on each side of the river, near the fort. This seigneury received his name. (It gave birth to the present-day village of Chambly.) Several of his soldiers settled near him. Buade de Frontenac named him commandant of the south side of the river, from Rivière du Loup to Montreal. On 5 May 1673 he was appointed governor of Acadia, to replace Andigné de Grandfontaine. In the autumn he went to Pentagouet from Quebec, on a small ship, the Saint-Jean. He was not long in command there, for the very next summer he was attacked by a party of Dutch pirates commanded by Aernoutsz and Rhoades. His little garrison of 30 men was not able to withstand the assault and surrendered after a short combat. Chambly was taken prisoner and carried off to Boston with Pierre Joybert de Soulanges, who had been captured at Jemseg. His ensign, Jean-Vincent d’Abbadie* de Saint-Castin, carried the news to Quebec. Frontenac paid the ransom, but Chambly could not be freed until the following year. Having returned to France, on 20 May 1676 he received command of Acadia once more. He had formed some ambitious projects which interested Colbert, who promised him 4,000 livres to pay for the passage of 30 soldiers and 100 settlers. Chambly does not, however, appear to have returned to Canada, since he had already been appointed military commander in the West Indies on 3 Sept. 1677. Having been named governor of Grenada on 24 April 1679, he bequeathed his seigneury of Chambly to his fiancée Marie-Françoise de Thavenet, one of whose sisters, Marguerite*, had married Joseph-François Hertel de La Fresnière*. It was in this way that the seigneury of Chambly passed into the hands of the Hertel family. 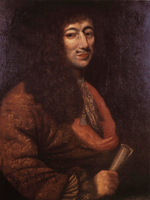 After being appointed governor of Martinique the following year, Chambly died there in 1687. AN, Col., B, 1, 5, 7, 9; C11D, 1. “Correspondance de Frontenac (1672–82),” APQ Rapport, 1926–27. “Correspondance de Talon,” APQ Rapport, 1930–31. P.-G. Roy, Inv. concessions, II, 196–97. BRH, XXII (1916), 374; XXIII (1917), 14–16. Robert La Roque de Roquebrune, “Les demoiselles de Thavenet,” NF, V (1930), 86–91. “À propos du sieur de Saint-Castin,” BRH, 41 (1935): 611–13. René Baudry, “CHAMBLY, JACQUES DE,” in Dictionary of Canadian Biography, vol. 1, University of Toronto/Université Laval, 2003–, accessed April 21, 2019, http://www.biographi.ca/en/bio/chambly_jacques_de_1E.html.